This is a review of the product Revitalize. The manufacturer of this product claims that it has been carefully formulated with the help of active ingredients that have an ability to stop the hair loss and initiate the regrowth of hair in both men and women. Read on to learn more about its ingredients as well as our opinion of whether it is the right product to take for the growth of your hair. Other ingredients include Gelatin, Magnesium Stearate and Silicon Dioxide. It is recommended that, adults take two capsules of this product daily, preferably with a meal. The ingredients of this product include soy in the form of plant sterols and wheat in the form of barley grass. Individuals allergic to these items can experience an allergic reaction and in such a case you need to contact a doctor immediately. The original price of this product was $21.99 but it is now available at a price of $15.99 on the company’s website and includes 60 capsules which are enough to last a full month. The manufacturer of this product does not offer any kind of warranty, return or exchange. This is an area of concern because if you are not satisfied with the product then you have no way of returning it or getting your money back. The product also doesn’t have any reviews on the company website, which makes it a questionable purchase. 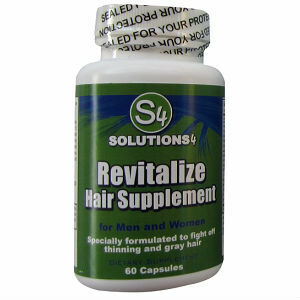 Revitalize is a supplement that has been specifically designed with ingredients that can fight hair loss and promote new hair growth. It includes various ingredients that can target the hormone known as DHT which is responsible for hair loss and stop its formation. It can also help in fighting gray hair. However, it contains Gelatin and is therefore not suitable for vegans and vegetarians. It also contains soy and wheat and as a result can be dangerous for sensitive individuals. The manufacturer also doesn’t offer any sort of guarantee for this product. All this combined with the fact that this product has zero reviews on the company’s website is a clear indication that this is not the best product for you. John Brownstone	reviewed Revitalize	on July 29th	 and gave it a rating of 2.5.